Can I access the PERISTM solution, MyFunding module, via my.pitt.edu? Yes, the PERISTM solution is listed in the right-hand column of the Pitt Passport homepage. You can directly access the PERISTM solution at www.peris.pitt.edu. How can I find my login and password for the PERISTM solution? The login and password are your Pitt credentials (your email address and password). Your University of Pittsburgh computing account password can be reset here. Can I generate a PDF or printer version of an application in the solution? Yes, for proposals submitted Grants.gov via Click Grants (SF424) there is an option to “Generate a PDF” of the Grant Application on the left-hand side in the SF424 Workspace.For all submissions, you can select “Printer Version” on the main funding proposal workspace to generate a printer version of the information entered into the funding proposal. Can I create a funding proposal in the MyFunding module if it is not a federal grant? For example, a proposal to a foundation, a corporate sponsor or federal contract? Yes, you can “Create a Funding Proposal” by selecting either “Other (Submitted by Office of Research)” or “Other (Submitted by Department)” on the General Proposal Information smart form in your funding proposal. The MyFunding module replaces the 0136 stock forms. What type of proposals are considered “System-to-System”? A system-to-system proposal is one that is completed in the MyFunding module and submitted through Grants.gov to the sponsor. In a system-to-system proposal, no work is performed outside of the solution. An example of a system-to-system proposal would be an R01 to the National Institutes of Health (NIH). What type of proposals are considered for “Other (Submitted by Office of Research)” or “Other (Submitted by Department)”? “Other (Submitted by Office of Research)” or “Other (Submitted by Department)” submissions are considered to be non-system-to-system proposal submissions. Proposals submitted Grants.gov via Click Grants (SF424) are considered system-to-system submissions.An example of an “Other (Submitted by Office of Research)” would be a National Science Foundation (NSF) proposal, an American Heart Association proposal, etc., which the Office of Research personnel completes the final submission in the sponsor’s system. An example of an “Other (Submitted by Department)” proposal would be a proposal where the University would be a subrecipient and receive a subaward, which the department personnel completes the final submission to the sponsor. How many people can you grant access to for “edit” and “view” rights within a funding proposal? There is no limit on how many people can be added for “edit” and “view” rights.Personnel with Pitt credentials will be able to view or edit funding proposals in The MyFunding module. If you are a UPMC employee and need a sponsored account you can find more information here. Who starts the funding proposal? Either a department administrator or principal investigator can start a funding proposal, however, others can be granted access to the funding proposal with either “edit” rights or “view only” rights by adding them within the funding proposal on the “Proposal Description & Contacts” smart form. What sponsor level detail should we enter into the MyFunding module? For example, if I know the Institute and Center at the NIH, should I select NIH/NIDDK or just National Institutes of Health? If you have the information on the specific institute or center, you should select that as your sponsor. This level of detail will assist with reporting for both departments and the institution. What if my sponsor is not listed in the solution? To enter a sponsor that is not listed in the solution, enter the sponsor name into the free text box (this is located under the statement “If Sponsor does not appear in list, enter name here”). The solution will then automatically add “TBD” as the Direct Sponsor. The PERISTM team will then add this sponsor to the list of sponsors in the MyFunding module. Can two people work on a proposal at the same time? Yes, two people can work on a proposal at the same time, however, both cannot edit the same smart form at the same time. If more than one person attempts to work on the same smart form simultaneously, it will allow one to edit, and allow the other person to have “read-only” access to the smart form. How do I prepare a Fellowship proposal in the MyFunding module? You can prepare a Fellowship proposal in the same manner as you prepare other types of proposals. However, you will need to enter the tuition, fees and stipend as a general cost and not as personnel costs. Can we only add people to funding proposals that are part of our department? No, everyone who is listed as an employee (faculty, staff and students) are available to be selected within the MyFunding module. However, some individuals (such as students) may not be active, because they may not be currently involved in research. If someone is not listed or active, please contact the PERISTM team at perisproject@pitt.edu. If my faculty member is on a study section and receives additional time for proposal submission, what due date would be listed in the funding proposal? The solution imports the Funding Opportunity Announcement (FOA), therefore, it will automatically enter the standard FOA due date. However, you can include a comment on the Submission Dates smart form to notify the Office of Research that the principal investigator is on a study section and has rolling submission privileges. Do I add the to-be-determined (TBD) personnel to the “Additional Personnel” section of my funding proposal? 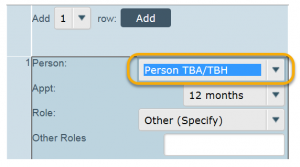 No, TBD personnel are added on the “Personnel Cost” section of the budget by adding a row to the budget and selecting TBA/TBH in the drop-down list. Will the non-institutional personnel entered into the funding proposal populate onto the SF424? If the non-institutional personnel are marked as “Senior/Key Personnel” or “Other Significant Contributor” they will populate onto the SF424. What document formats can I upload to the solution? PDF documents should be used to prevent errors in system-to-system proposal applications. Other file types can be uploaded; however, it is not recommended to ensure proper formatting in accordance with sponsor proposal preparation guidelines. Can I add or remove personnel from the application mid-way through preparing the funding proposal? Yes, you can add or remove personnel from the funding proposal while it is in a draft state. Can I grant someone access to a proposal after it has been submitted through the MyFunding module? No, however, the PERISTM team can grant access by emailing perisproject@pitt.edu for assistance. How do I attach a document to my proposal? There are various prompts throughout the funding proposal and Budget to add attachments. 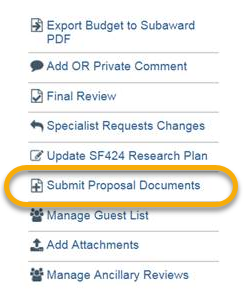 The “Add Attachments” activity is located on the left-hand side of the main funding proposal Workspace and is preferred location for adding documents that are not part of the Research Plan component of the SF424.In addition to the “Add Attachments” activity, the option to add attachments is also available when you “Submit for Department Review”, and “Submit for Specialist Review”. Does the “Clarification Requested” email notification go back to the last reviewer? Yes, except for “Specialist Clarifications Requested”. The Specialist, your Office of Research contact, has the ability to select who to send the clarification request to for information or corrections. If the IP Management Plan is marked “no”, will that prevent my proposal from being routed? No, this will not stop the proposal from being routed, but if the proposal is federal, the Office of Research will be unable to submit until the IP Management Plan has been completed. What documents are required to “Submit Proposal Documents” in a non-system-to-system proposal? Any documents relevant to the review of the proposal, for example, documents that require institutional endorsement and RFA. However, you are not required to include documents from other electronic Research Administration (eRA) systems, such as copy of the Fastlane proposal. The final copy of the proposal will be added by the Office of Research Specialist once the proposal has been submitted. If you are processing a proposal that requires the department to send the proposal to the sponsor, the Office of Research Specialist will return the documents required by the sponsor to the department administrator through the MyFunding module. 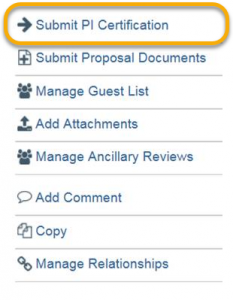 Documents can be found in the “Attachments” tab of the funding proposal workspace. What does the “Disapprove” feature do in the MyFunding module? The “Disapprove” feature permanently withdraws the proposal and stops it from moving forward or being further worked on and places the proposal in a “withdrawn state”.Department and school reviewers should only use this feature if the proposal should not move forward. If a proposal has been accidentally “Disapproved” the “Copy” feature can be used to create another identical funding proposal. Can a copy of an application be made in the MyFunding module? Yes, a “copy” feature is available in the MyFunding module, located on the main funding proposal workspace on the left-hand side of the tool bar. When a copy of a proposal is created the attachments are also copied into the new funding proposal. Does the “Jump-to” function in the MyFunding module save my work? No, you should “Save” before you utilize the “Jump-to” feature. If I answer “yes” to a compliance question, such as “yes” to human subjects, will I be required to upload the approval? No, you will not be required to upload the approval at the proposal stage, however, you will be required to upload these documents for award activation.If you answer “yes” to use of the RBL, you will be required to upload the approval at the time of proposal since this approval is required for submission to sponsor. Can you delete a record?No, if you decide not to submit the funding proposal, you can mark it as withdrawn. Funding proposals cannot be deleted as the information in the MyFunding module is now considered the institutional file of record. Are the base salaries pre-populated in the funding proposal? No, the base salaries must be entered manually into the budget grid of your proposal. How do I include graduate student fringe benefits (GSFB)? 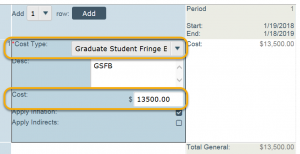 Including GSFB is a multi-step process:The graduate student salary should be entered into the Personnel Grid with the fringe benefit rate listed as 0%. On the next budget grid “General Costs”, select from the drop-down menu the Cost Type “Graduate Student Fringe Benefit Cost”. Subsequently, add the dollar amount for the fringe benefits. The cost will be automatically excluded from the MTDC, based on the selection of Graduate Student Fringe Benefit as the Cost Type. Where should Graduate Student Fringe Benefits be Listed on the SF-424 in MyFunding? to the Other Personnel section (Section B of the SF-424) in order to be consistent with the University of Pittsburgh’s Financial Guideline on Direct Charging Practices. Do I need to include a detailed description in the budget for each item entered? No, you can enter a basic description for the cost of the item into the budget. The only required description is for equipment. What is considered a standard Indirect Cost Rate? Standard Indirect Cost Rates are those listed within the current Rate Agreement issued by the University annually. How do I incorporate the Subaward R&R budget? 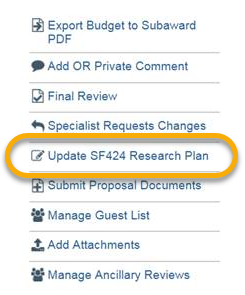 The Research & Related Subaward Budget (R&R Budget) can be imported into the SF424 Workspace by selecting the activity “Import Subaward” located on the left-hand side of the toolbar. How does the solution handle budget years that are over the modular amount? For budget years that are over the modular amount, the solution will NOT roll-down to the modular amount and will map the dollar amount in the detailed budget into the SF424. In this instance, the proper module will need to be entered directly onto the SF424 to prevent an overage being submitted within the proposal application. If my budget contains some on-campus activities and some off-campus activities, what do I do? Can I build multiple budgets in the MyFunding module? Yes, you can build as many budgets as you would like and subsequently select which budgets to include in the proposal prior to submission. How do I enter split fringe benefit rates? Do not enter split benefit rates. Use the rate in effect at the time of proposal. How many decimal points is allowed for effort in the Personnel Costs section of the budget? Two (2) decimal places are allowed for effort in the Personnel Costs section of the budget. Is a detailed budget required for a modular budget submission? No, when a modular budget is proposed a detailed budget is not required. Does the MyFunding module allow non-budget edit access? No, if an individual has edit access, then he/she can access and edit the entire funding proposal. For personnel above the salary cap, how will this be handled in the budget? When project personnel salaries exceed the salary cap, a separate cost sharing budget can be created. 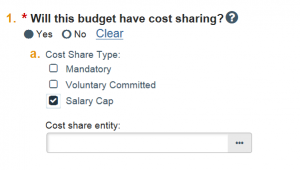 When answering “yes” to the below question and indicating “salary cap”, a separate cost-sharing budget will be automatically created by the solution (See below). The cost-sharing budget can then be completed to include the cost-sharing categories and amounts. Can I route a proposal without an approved subaccount budget? All subaccount budgets must be approved before routing begins. If a funding proposal is routed prior to the approvals being obtained there will be no option for the subaccount department to approve the subaccount budget. Will the subaccounts only see their subaccount budget, or will they see the entire budget? The subaccount departments will only see the budget that you as the master department have routed to them for approval. How do I route a subaccount budget in the MyFunding module? To route a subaccount budget, you must create an additional budget by selecting “Create Additional Budget” in the funding proposal Workspace. When creating the budget, indicate in Question 3 that the budget is a subaccount budget. The ability to select the department and department administrator for the subaccount will appear. Select the subaccount department and the administrator responsible for approving the sub-account. Once complete, select the activity “Send for Subaccount Review” on the left-hand-side of the subaccount workspace. Does the MyFunding module create modular budgets with the subaccount budgets included? No, the solution does not have the capability to create modular budgets from multiple budgets. When a modular budget is being submitted for the overall proposal, the subaccount budget feature should be used as a routing tool to obtain approval for the subaccount, but that budget should not be included in the proposal.Instead, one cumulative budget should be created that includes all costs for the project. That budget should be included in the proposal. The solution will use the cumulative budget to create the modules. Can the Principal Investigator upload their own documents into the MyFunding module? Yes, the principal investigator has access to all of their proposals and can upload the documents.. If I have a new principal investigator coming on board, how can I add this faculty member to the MyFunding module? The PERISTM portal receives a nightly feed from Human Resources that updates all new personnel. However, if you do not see someone, please email the PERISTM team at perisproject@pitt.edu. How is a Principal Investigator Certification (PI Certification) request initiated? Can I submit my proposal to the Office of Research without the Principal Investigator Certification being completed? Yes, you can route the proposal to the Office of Research for review without the Principal Investigator Certification, however, the proposal cannot be submitted to the sponsor without Principal Investigator Certification. Principal Investigator Certification, is this required for all proposals? Yes, Principal Investigator Certification is required for ALL proposals to ensure the proposal is accurate and ready for submission. Do I still need to complete my proposal applications in ASSIST? ASSIST is available as an option to complete U, P, or SPORE grants. 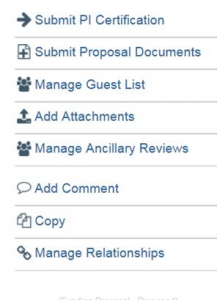 When completing one of these types of proposals in ASSIST, a funding proposal must still be completed in the MyFunding module. This type of submission would be considered non-system-to-system and entered into the MyFunding module as “Other Submitted by Office of Research” within the funding proposal smart form. Can I still use FastLane to submit my NSF proposals? Yes, NSF proposals would be submitted through Fastlane and the MyFunding module, as an “Other (Submitted by Office of Research)” funding proposal type. Will the MyFunding module be used to process CRDF proposals? No, the MyFunding module does not support internal funding opportunities. Do proposals get submitted through eBRAP (DoD’s eRA system)? All proposals that use Grants.gov can be submitted through the MyFunding module. Does the Principal Investigator receive a notification when a proposal is started? No, the Principal Investigator does not receive a notification when a proposal is started. Who receives the notification that a proposal was submitted to the sponsor? The Principal Investigator, Department Administrator, and all personnel listed with edit rights in the funding proposal will receive notification that a proposal was submitted to the sponsor. Who receives the notification that a clarification is requested on a proposal? A clarification requested notification is received by both the Department Administrator and the Principal Investigator when clarifications are requested on a proposal. Are notifications generated for proposals submitted by the department? A notification is generated to both the PI and the department administrator when the activity “Proposal Returned to Department for Submission” is completed by the Specialist in the Office of Research.